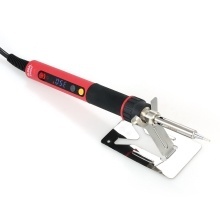 This professional soldering iron comes with LED display, constant temperature and 900M heater tip. It has temperature setting function that you can adjust it to a suitable temperature for different projects. It&apos;s a great tool for electronics, computer equipment, watch repair and other craft projects. Heats Up Fast: With quick heat-up and fast thermal recovery for permitting high quality soldering work. Temperature Range: 80～500℃(176～932℉) for using with high grade temperature sensitivity. Adjustable Temperature: Set the desired value to meet your soldering needs with constant temperature. Clear LED Display: LED digital display to show the temperature clearly with 2 kinds of temperature units(℃/℉). Replaceable Tip Design: Easy to install and replace the tips, time-saving and efficient. Longer Life with High Quality: Heat-insulated and non-slip high temperature plastic handle provides comfortable and secure operation. NOTE: Please do not touch the soldering tip metal part when the power is turned on. Please turn off the power when resting between usage or finished soldering.